TORONTO, ON – November 28, 2018 – With its bumper-to-bumper, wheels-to-roof transformation, the 2020 Toyota Corolla was already big news in sedans for 2019. And now comes the ultimate “But wait, there’s more!” bonus: a new hybrid model that will have an anticipated combined fuel consumption of less than 5.0L / 100 km. That makes the 2020 Corolla Hybrid the most fuel-efficient model to ever wear the model name that debuted more than a half-century ago. The design isn’t the only thing electrifying about the Corolla Hybrid. This high-efficiency model adapts the latest Toyota Hybrid Synergy Drive from the new-generation Prius, already proven as a fuel economy winner. Only Toyota offers such a distinct choice of hybrids in this vehicle segment, thus catering to customers who have different tastes in design but the same desire for maximum fuel efficiency. 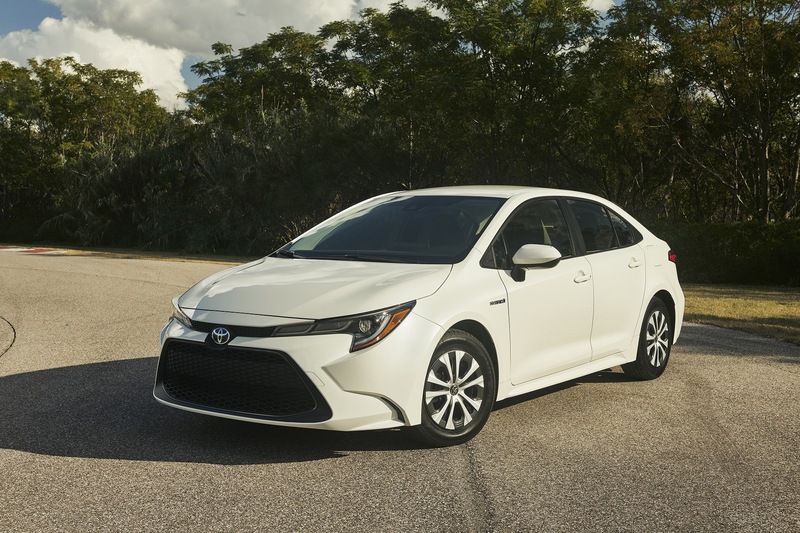 The 2020 Corolla Hybrid, like its gas-powered siblings, delivers a highly-satisfying driving experience, along with the brand’s latest advances in comfort and multimedia technology. As on the 2020 Corolla gas models, the Toyota Safety Sense 2.0 suite of active safety systems comes standard. The 2020 Corolla Hybrid is yet more evidence of Toyota’s indisputable global hybrid leadership, which began more than 20 years ago. The hybrid powertrain and battery were a natural fit for the new Corolla because of the Toyota New Global Architecture (TNGA) platform. There’s no compromise in cabin roominess, for example, when choosing the Corolla Hybrid versus a gas model. The new hybrid system combines a 1.8-litre four-cylinder gasoline engine with two motor/generators through an electronically controlled planetary-type continuously variable transmission (CVT) transaxle. Combined system output of 121 horsepower yields decidedly responsive performance. The nickel-metal hydride (Ni-MH) battery pack employs a newly developed technology called Hyper-Prime Nickel™ to boost battery performance in a smaller and lighter package. The battery’s smaller size and flatter shape allow it to be packaged under the rear seat, rather than taking up trunk space, and also allowing a 60/40 split folding rear seatback to expand cargo capacity. The battery location also contributes to the vehicle’s lower centre of gravity, a boon to agility. The engine, working in concert with the electric motor (MG2), assures responsive performance, while exemplary energy efficiency is achieved by using both electric motors (MG1 and MG2) for hybrid battery charging. The Corolla Hybrid’s linear acceleration response may take some by surprise. When pulling away, the battery provides a subtle power boost in order to put less strain on the engine and eliminate the “rubber band” effect experienced with some hybrids. A preload differential adds to the confident acceleration feel. During low loads and low differential rotation, differential-limited torque is distributed to the left and right wheels, yielding excellent handling stability. At mid-range and high engine loads, the preload differential functions as an open differential. Corolla Hybrid has EV mode, which allows the vehicle to be operated as a pure electric vehicle for short distances, depending upon certain conditions, such as battery charge level. This mode is useful for operating the vehicle in parking lots or indoor parking garages, for example. The Vehicle Proximity Notification feature alerts pedestrians of the vehicle’s presence when running in battery mode. Along with the expected NORMAL and ECO drive modes, a SPORT drive mode setting allows for an increase in power for stronger acceleration response when desired. NORMAL mode: Allows the hybrid system to achieve an ideal combination of fuel economy and vehicle acceleration. The accelerator opening amount changes linearly in response to accelerator pedal operation. ECO mode: Improves hybrid system efficiency by limiting power in response to light to moderate accelerator pedal input. SPORT mode: Available power is increased, allowing for improved acceleration response. Another boost to efficiency comes from the Electronically Controlled Brake (ECB) system, which coordinates operation between the regenerative braking force of the electric motors and the hydraulic braking system force to provide optimal stopping power. By proactively using the electric motors to recover as much electrical energy as possible from the regenerative braking system, this extremely efficient cooperative control helps to maximize fuel economy. An active hydraulic booster on the conventional (non-regenerative) braking system improves pedal feel and feedback for the driver. Critically, should there ever be a malfunction in the ECB system, the conventional hydraulic braking system can stop the vehicle. Brake Hold, when engaged, is a convenient technology that reduces driver effort while waiting at a traffic light or while driving in heavy traffic. When the driver presses the accelerator, Brake Hold releases instantly. The other half of the Hybrid Synergy Drive team, the gas engine, is no less impressive than the electric side. The 2ZR-FXE 1.8-litre inline four-cylinder engine was designed specifically for a hybrid application. The long-stroke configuration employs the Atkinson cycle, which uses a very high compression ratio (13.0:1) along with a shorter intake stroke and longer expansion stroke than the Otto cycle. The Atkinson cycle extracts more energy from the fuel, and the electric motors compensate for reduced low-end power (versus the Otto cycle). Friction created by the piston skirts, rotating parts and oil pump is reduced, and an electric water pump eliminates the parasitic losses with a conventional belt-driven pump. Toyota sought efficiency gains in every system. The highly-efficient air conditioning system, for example, uses S-FLOW control, which automatically optimizes airflow throughout the cabin according to the temperature setting, actual cabin and outside temperatures, sunlight intensity, and occupied seats. Getting the engine up to operating temperature quickly is critical to conserving fuel and reducing emissions at start-up. In the Corolla Hybrid, an exhaust heat recirculation system speeds up engine coolant warm-up. That in turn allows the hybrid system to stop the gas engine earlier and more often in the driving cycle when it’s not needed, for example in low-power-demand city driving conditions. The PTC (Positive Temperature Coefficient) heater quickly provides cabin heat electrically in cold temperatures. The Corolla Hybrid rolls on 15-inch aluminum alloy wheels with low-rolling resistance tires. As on the Corolla gas models, the new multi-link rear suspension improves both handling agility and ride comfort compared to the previous-generation Corolla Sedan. The instrument panel uses a high-grade meter with a 7-inch Multi-Information Display (MID). The MID shows the speedometer, as well as a hybrid system indicator/real-time battery charge status indicator. ECO accelerator guidance, also shown in the MID, can provide a guideline for maximizing fuel efficiency by coaching the driver on optimal accelerator pedal operation to match driving conditions. Drivers who like the visual appeal of seeing engine rpm can choose to display a tachometer. The 2020 Corolla Hybrid’s multimedia offerings start with the standard Entune™ 3.0 Audio system that includes: 8-in. touchscreen display; six speakers; Apple CarPlay compatibility; Entune 3.0 App Suite Connect; Safety Connect; Scout GPS Link Compatible; Siri Eyes Free; auxiliary audio jack and USB 2.0 port with iPod connectivity and control; AM/FM; MP3/WMA playback capability; voice recognition training and tutorials; hands-free phone capability; voice recognition; music streaming via Bluetooth; customizable home screen, and weather/traffic information via Entune 3.0 App Suite. The Corolla Hybrid features eight standard airbags and Toyota’s Star Safety System, which includes Enhanced Vehicle Stability Control, Traction Control, Electronic Brake-force Distribution, Brake Assist, Anti-lock Braking System, and Smart Stop Technology. All Corolla models come equipped with a standard backup camera. Significantly, all 2020 Corolla models are equipped as standard with Toyota Safety Sense™ 2.0, an advanced suite of integrated active safety features. PCS (Pre-Collision System): Is designed to automatically activate the brakes to help avoid a collision or mitigate the impact force. PCS is able to detect a vehicle or pedestrian in day and low-light conditions, as well as a bicycle during daylight. Full-Speed DRCC (Dynamic Radar Cruise Control): Designed for highway use, designed to maintain a set vehicle-to-vehicle distance and is also capable of low-speed following up to speeds of about 24 mph. The Corolla can stop when the vehicle ahead comes to a stop, maintaining an appropriate distance to it. LDA (Lane Departure Alert) w/ Steering Assist: Designed to give the driver audible and visual warnings and, if necessary, provides steering assistance if it detects the possibility of leaving the driving lane. It also detects excess weaving within the driving lane that might indicate driver distraction, inattention or drowsiness. LTA (Lane Tracing Assist): LTA is enabled when LDA and DRCC are both on and active. LTA employs a lane centering function that will make constant steering inputs to help the driver keep the vehicle in its lane. LTA is designed for uses on relatively straight highways to preemptively avoid unwanted lane departures and reduce driver fatigue. AHB (Automatic High Beam): When enabled, detects the headlights of oncoming vehicles and taillights of preceding vehicles and automatically switches between high and low beams as appropriate. The 2020 Corolla Hybrid will go on sale in Canada in the Spring of 2019.